South West Florida Bicycle United Dealers (SWFBUD) Bicycle Bash is moving to the next level! Hi guys... Julian back again with even more news for you: In 2010, SWFBUD&apos;s popular Bicycle Bash is moving to the next level -- and a new home, Flatwoods County Park in Hillsborough County on Nov. 7, the first Sunday in November. Click Here for a map to the location on Morris Bridge Road off Interstate 75 outside Tampa. The 2010 Bicycle Bash Classic, Presented by Cure on Wheels will continue to feature its fun bicycle exhibitor/vendor village -- but this year the bicycle festival will also include live bicycle riding in Flatwoods Park outside Tampa. The synergy of bicycle exhibitors and bicycle activities is designed to get people excited about biking and increase the profile of bicycling in the Tampa Bay market -- two of SWFBUD&apos;s goals. The Flatwoods venue for bicyc ling is among the most scenic for cycling in Florida, offering activities for both road bicyclists and mountain bikers. This year&apos;s Bicycle Bash -- now in its fifth year -- will also host the Cure on Wheels charity bike ride, which raises money for local cancer research. For the second consecutive year, SWFBUD and the Bicycle Bash is proud to have Cure on Wheels as the presenting sponsor for the Bicycle Bash festival. 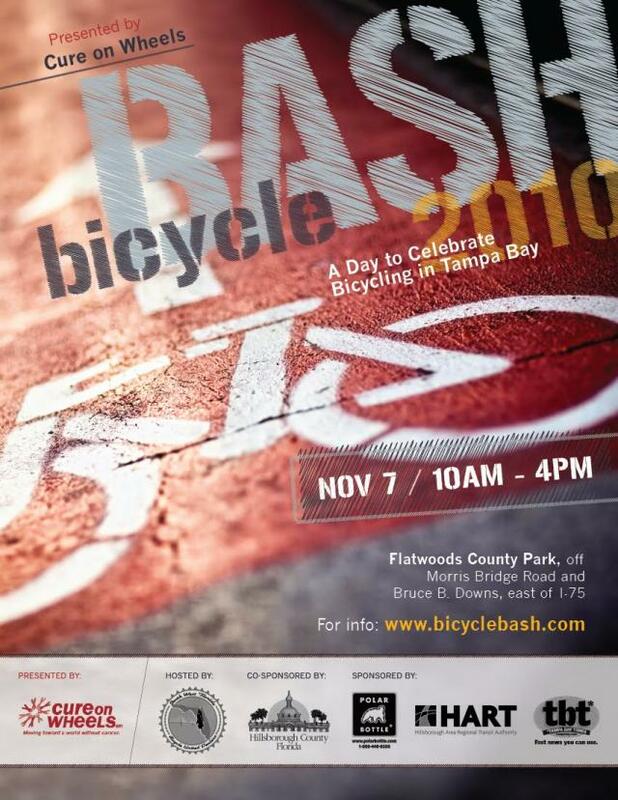 celebrate bicycling and grow cycling in the Tampa Bay region. SWFBUD also lobbies local governments throughout the year to commit more resources to bicyclists. Hillsborough County will serve as a co-sponsor. SWFBUD is also partnering with the Tampa Bay Sports Commission, which will help promote and market the Bicycle Bash Classic, Presented by Cure on Wheels. To see a video of last year&apos;s Bicycle Bash, click here. To read the Bicycle Bash press release, click here. Cure on Wheels, contact Alan Snel at alansnel@yahoo.com. So as you can see, coming back here often really pays off... we keep you up-to-date with all the exciting events and things going on in the Tampa Bay area!